One thing that we should get out of the way first, though, is that obviously Sailor Venus is a bit of an exception to this rule. Having started out as the sailor-suited warrior of love and justice, Sailor V, Minako was granted her own assortment of transformation items and attacks, though most of these didn’t carry through to Sailor Moon. 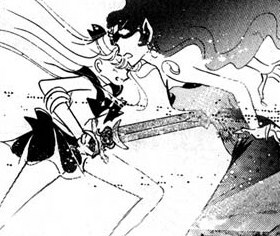 The status of Sailor Venus’ Love Me Chain is also a bit unclear, since in the manga it seems to pretty clearly be an attack utilizing the chain wrapped around her waist as a belt, while the anime seems to portray it as a magical / energy attack. 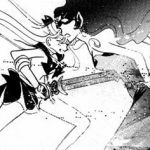 In the manga, she also wields — for a short time — the Sword of the Silver Crystal, a mystical sword kept at the ruins of the Moon Kingdom and the very sword which Princess Serenity used to kill herself after the death of Prince Endymion. But what about the rest of the Sailor Soldiers? As we all know, the idea of the Sailor Team is loosely based on the super sentai concept popular in Japanese children’s programming,1 and weapons unique to each character is a common theme in those series. 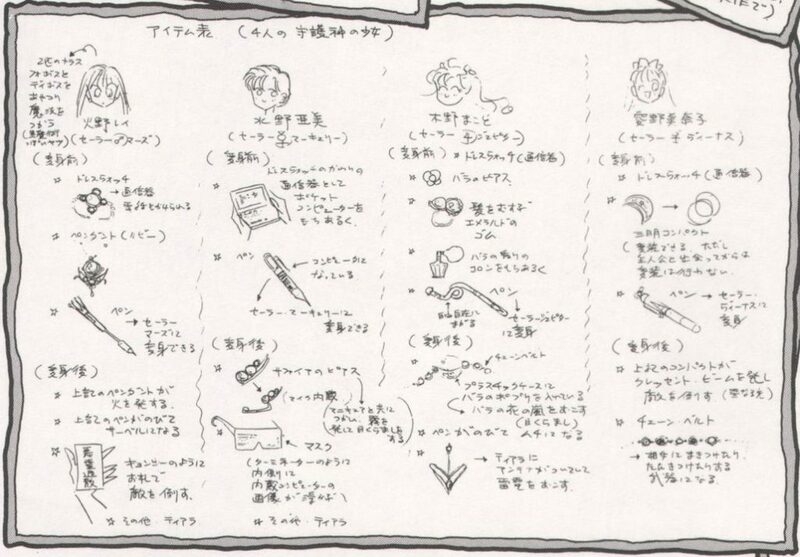 Upon going back to Ms. Takeuchi’s original concept art2 leading up to the creation of the manga, it seems that in addition to the items we already know about, there were some more weapons originally planned for each of the characters. Let’s take a look! This is of course the pocket computer we all know and love. Nothing special written here! What is interesting about Sailor Mercury’s original pen is that, according to the original design, it was meant to be a computer as well. Not only does the microphone come out from her earring, but originally she was supposed to use it together with her nail polish to release a fog and blind enemies. Or, as Ms. Takeuchi describes it: “Like the Terminator, there is a computer built-in and an image appears on the inside.” Possibly related to Ami’s origins as a cyborg? Prior to transformation the pendant didn’t have any special abilities, but after transforming into Sailor Mars, she was originally intended to use the pendant to shoot fire. Not only does her transformation pen have a unique arrow shape to it (possibly a precursor to her Flame Sniper attack used much later in the series? ), but after transforming it was supposed to extend out and turn into a saber, to be used as a weapon. Not a weapon per se, but listed among Makoto’s items is a bottle of rose perfume, which she carries with her wherever she goes. In addition for being used to transform Makoto into Sailor Jupiter, according to the notes the pen was also supposed to extend out into a whip for her to use against enemies. Sailor Jupiter is described as also having a chain belt, but in the center of it was a plastic4 case which was to be filled with rose potpourri. When she opened it up, a rose petal storm would come out to blind the enemies. Much like was actually used in the anime and manga, an antenna was to pop out and be used in her signature lightning attack. Pretty similar to how it was actually used in the actual series, the Crescent Moon Compact was supposed to give Minako the ability to disguise herself and, as Sailor Venus, allow her to shoot the Crescent Beam. Sailor Venus’ belt wound up pretty similar to what was originally planned, though it is noted in the description that the belt would be used to both tie up and strike enemies. And there you have it! While some of Ms. Takeuchi’s original ideas were ultimately used in the manga and the anime, it’s interesting to see what could have been when considering the additional weapons and items for each character. Perhaps some of them, like Makoto’s perfume, did actually make it into the manga but were never called out? 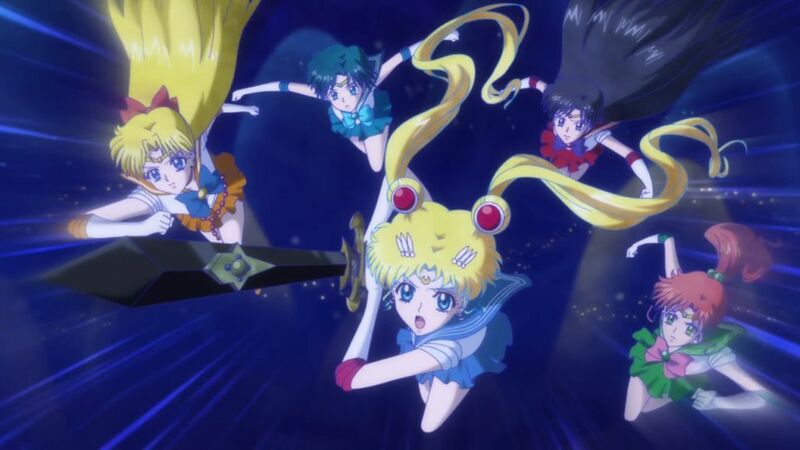 Ultimately, I think the magical powers suit the Sailor Team much better than any weapons could, and the addition of the deadly Silence Glaive and other weapons in the third story arc added a further sense of strength to the Outer Sailor Soldiers, so I suppose I’m okay with the difference. Still, though, it’s always fascinating to see what could have been! ← Was Naru Intended to Be a Bigger Part of Sailor Moon? Oddly enough in the Live Action Series, the Inner Senshi did briefly get to wield weapons at the very end. Mercury had a sword, Jupiter a spear, and Mars and Venus got daggers. Whether or not that was inspired by these concepts I don’t know. On the subject of using their own personal strengths and powers. I really wish they could have done more with Rei’s psychic/supernatural abilities. I say that largely because it’s such an interesting aspect of her character, that’s tragically underutilized outside of the odd premonition. Having them grow more potent and versatile in combat as the series went along would have been a nice bit of development with lots of possibilities. Because if the likes of X-Men has taught us anything, advanced mental powers are something to be very wary of. Far more then any physical based weapon. 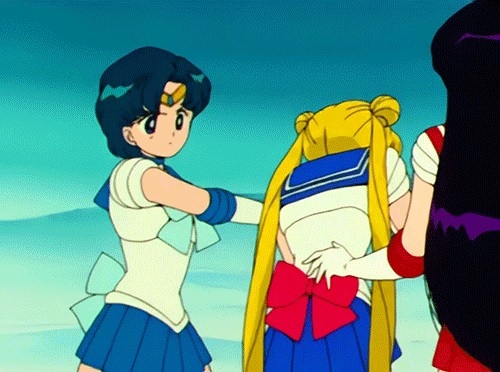 Given how often enemies in Sailor Moon are fond of employing the likes of mind-control, illusions and hypnosis, it would have been amusing to see the tables turned back on them for once. I can definitely imagine a situation where Rei really looses it, and badly messes someone up in retaliation. One of the biggest problems with Rei’s premonitions (putting aside for a second how under-utilized they were) is the fact that as the series progressed, just about everyone would have premonitions from time to time. Michiru, Usagi, Mamoru, to name a few off the top of my head. It seems so harsh to Rei that she has to spend all these hours of dedicated spiritual training to get this sensitivity to the immaterial realm, yet the others just kind of come across them naturally. I found that the Outer Senshi in particular had a rather annoying habit of outdoing the Inners at many of their own skills. Like having Haruka being a better fighter then poor Makoto. That’s why I think they should have expanded the likes of Rei’s abilities further. The third arc often went out of its way at making them look better at their expense, that I can’t help but get the impression Naoko may have favoured them more. On the subject of uniformity, that’s one of the reasons why I personally don’t care much for the Eternal forms. Due to how similar they all looked compared to previous designs. I feel that each of the Senshi should have got more unique outfits as they powered up. Something that reflected their regal positions better. As for the attacks, well that’s stock footage for you. It’s easier and cheaper to draw single panel variations then to animate them. And anime does tend to work on the principle of don’t draw when you can reuse. Though personally I would have preferred them to have used Thunder Dragon over Supreme Thunder. I’m amazed it was only a one-off. At least in stuff like the films we get some more dynamic shots. It’s a problem that almost every super sentai series has always had when introducing a new character, in that the “Newcomer” is always always more powerful than the original team in order to try to make them interesting in some way. I know it was kind of hard to strike a good balance when they were trying to show off how powerful the new Outer Senshi were, but I still think there had to have been something they could have done. Even granted that it was necessary to make Haruka a better fighter than Makoto, or Michiru a better swimmer than Ami, I still think that in late Death Busters they could have started expanding on the Inner Senshi’s abilities to try to grow them further. But here I am complaining about pretty small details, I guess. Sabao Spray – Smokescreen that could also be used as a weak defensive shield as seen at D-Point. Could also be used to simply conduct and boost the strength of Jupiter’s electrical attacks. Shine Aqua Illusion – Medium damage single target attack. Her fastest charging damage attack (6 seconds). Also had a freezing version that used a stream of ice that froze the target at the point of impact. The frozen version was maybe a little slower moving. Aqua Rhapsody – High damage attack that maybe could have been used as a weaker multi-target attack. Also had a freeze on impact version. Much longer charging (10 second). Although the projectiles themselves may have been slightly faster and harder to dodge than Aqua Illusion. Sabao Spray Freezing – Large area attack that can be launched fairly quick (4 seconds) and simply froze anything in its path. This seems like one of the more dangerous attacks as if it had near the range of the normal Sabao Spray there seems like a high potential for icing a teammates if she is not careful. Aqua Mirage – Her longest charging attack by far (14 seconds!). May have been an element of homing sentience or control as it looked pretty impossible to dodge. Although it was just used as a high damage single target attack it seems possible it also could have maybe been a medium damage multi-target attack, or possibly even used to trap her foe like Berthier’s attack in the manga. Plus of course while not an attack in the anime she did have her weakness finding deus-ex computer/visor combo…which basically replaced Luna’s annoying unexplained ability to do the same. Crescent Beam – Highly precise high intensity piercing laser that could be fired pretty fast (3 seconds) and moves extremely quick too. Could have been one of the more difficult attack to hit against a moving target at range due to how precisely it has to be aimed. This attack required no more movement than raising one arm. Crescent Beam Shower – Significantly slower charging (7 seconds) and slower moving. Although she only used it against lone opponents its was potentially a medium-large area attack that could have done solid damage to anything/anyone unfortunate enough to be under it. Love-Me-Chain – Extremely versatile in that it could be used very quickly (2 seconds) to cut/bind/grab/defend/swing. Even when charging it seems like it could act like a defensive barrier around her. She may have had a degree of mental control over it too. Missing attack I most wanted for her to use was Venus Sulfur Smoke from the Sailor V manga…as none of the other senshi have anything remotely close to resembling a stink bomb attack like this… Major comedy potential lost here. Fire Soul – Single target slower moving low damage single target attack. However as seen at D-Point it required no body movement (besides an arm) to launch as she was laying on the ground when she used it. Able to fire it quickly (2 seconds). It’s also possible Mars maintained partial psychic control as evidenced when she uses it to create a fire ring around the lake yokai and has it follow around the vine of the DD-Girl. Burns whatever it hits (good for combos) and has a bit of fire splash damage that burns anything/anyone around the target too. Fire Soul Bird – Slightly larger than Fire Soul but taking significantly longer to charge (10 seconds). It also seemingly had either a sentience or even finer control for Mars as it seemed to be able home in on its moving target evading a projectile launched at it. Pierces instead of burns on impact. Burning Mandala – Slower to launch (6 seconds) but much faster moving attack than Fire Soul. Unlike Fire Soul it’s solid so it’s also better able to punch through enemy attack or solid objects (however this also means it can be deflected back at her easier) and at times had a bit of an explosive impact. It’s multi-projectile so it is also possible that it could have been used as her area attack although I don’t recall her actually using it as such (It’s hard to determine what she used against the daemon jelly at the end of S). Flame Sniper – High damage, high precision attack that penetrates the target with no splash damage. If she had this at D-Point she probably could have saved Jupiter much like she saved Neptune from the Nehellenia clone. Slower charging than Fire Soul but still not bad (5 seconds to be ready to launch although aiming can take a bit longer). Plus of course she had her ofuda which could be used to incapacitate and deal with spirits. Supreme Thunder – Mainly a single target attack that the longer she charged it the stronger it got (minimum charge around 6-8 seconds if you omit the unnecessary speech) so potentially it could have actually been her strongest attack if she charged it long enough. Not a precisely aimed attack and there can certainly be splash damage especially as it gets larger. No body movement required as seen when she was confined by the DD girls. This move could also be used as an slower moving area of attack beam which she could seemingly keep going for awhile (as long as her electrical energy/body held out as seen in R movie). Supreme Thunder Dragon – Potentially sentient or controllable with the way it stopped moving before pouncing on its target. It’s really big making it even harder to dodge although it is by far both the slowest moving and slowest charging (12 seconds) of all her attacks. Sparkling Wide Pressure – Single target only that could be charged for more damage much quicker (3 seconds). Aim is much more precise that Supreme Thunder but its also a shade slower moving. Slightly explosive impact at times. Oak Evolution – Strong single target attack that since its multi-projectile in theory could have maybe been used as a weaker area attack too. It’s not a fast charging attack (10 seconds). Not electrical based so no splash damage on impact instead it pushes backwards. She also used it defensively to deflect projectiles. It’s a shame the anime never gave her the incapacitating Flower Hurricane from manga.